6 After these things Jesus went over the Sea of Galilee, which is the Sea of Tiberias. 2 Then a great multitude followed Him, because they saw His signs which He performed on those who were diseased. 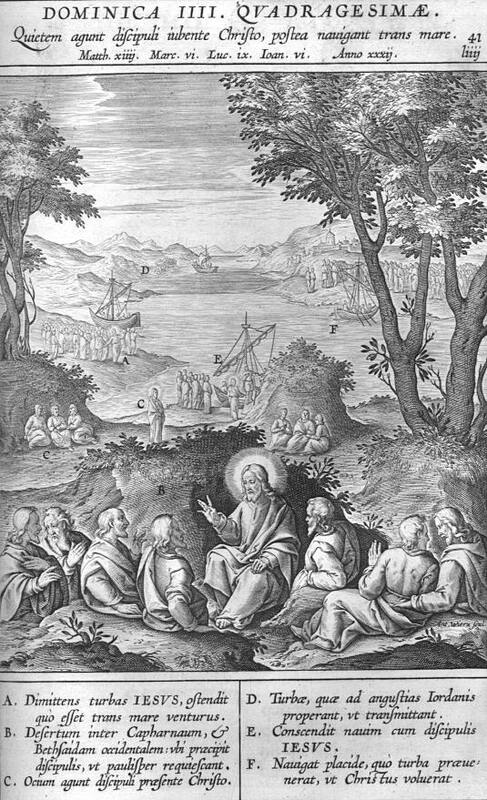 3 And Jesus went up on the mountain, and there He sat with His disciples. 5 If When Jesus then lifted up his eyes, and saw a great company come unto him, he saith unto Philip, Whence shall we buy bread, that these may eat? Whence shall we buy bread? The Lord Christ asks Philip, before the people complain or ask, in order that we should always let him care for us and know that he interests himself for us more and sooner than we do ourselves. 7 Philip answered him, Two hundred pennyworth of bread is not sufficient for them, that every one of them may take a little. 8 One of his disciples, Andrew, Simon Peter’s brother, saith unto him, 9 There is a lad here, which hath five barley loaves, and two small fishes: but what are they among so many? Two hundred pennyworth. We see that Philip is not deficient in arith metic. We also can count up very well what we shall need and must have for our household. But as soon as we see that provision is wanting, we become discouraged. This was the case also with Andrew. What are they among so many? The Evangelist did not wish this to be left unnoticed, in order that we may learn by the example of the disciples, that such calculations are entirely useless; if, indeed, we are Christians and have Christ with us. Nothing in the world hinders faith as much as riches on the one side and poverty on the other. Against these two things which hinder on both sides, Christ speaks here, and teaches the middle state; namely, to be neither too rich nor too poor, but learn to trust God, that he will sustain us, and be content with what God daily gives us. Who clothes the trees, which are bare in the winter, but as soon as the summer begins are loaded with leaves and fruits? Who causes the corn to grow so abundantly? Do not I, (as the Lord means to teach by this miracle, ) who herewith have fed 5000 people with two fishes and five loaves? But here reason says: Yes, as regards the trees and the corn and other things, that occurs every year; there fore it is not extraordinary and miraculous; but this feeding of 5000 people with two fishes and five loaves occurred only once; therefore it is extraordinary and miraculous. Answer: What is the reason that this appears to you extraordinary and miraculous, and that the former case, when out of single grains innumerable ones grow, is not miraculous to you? That is not the fault of God or his works, but it is the fault of your unbelief, that you are so blind and hardened, and can not know God’s wonders. First, That he performs this miracle not only for the benefit of the pious people, who follow him on ac count of his works and words; but also for the benefit of the belly-slaves, who seek only eating and drinking and temporal honor from him. V. 26; see Matthew 5:45. Secondly, In that he endures so kindly the rudeness of his disciples and weak faith. In taking the five loaves and giving thanks, he teaches us that nothing is too little for his people, and that he can easily bless that little, so that they shall have abundance, while even the rich in their riches have not enough. Psalm 34:11; Luke 1:53. 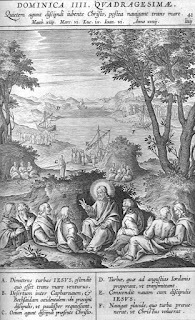 After this he “distributed to the disciples and the disciples to them that were set down.” Thus all the teachers take the word from Christ and give it to the people. See Matthew 23:10. And likewise of the fishes, as much as they would. He gave not as much as there was on hand, but “as much as they would.” Here we must not think that he did this only at that time and does not wish to continue to do so, also, among his Christians. For we see examples of this blessing every day; not only as regards food, but also as regards all other kinds of want, for which he wonderfully and unexpectedly devises ways and means. 12 When they were filled, he said unto his disciples, Gather up the fragments that remain, that nothing be lost. 13 Therefore they gathered them together, and filled twelve baskets with the fragments of the five barley loaves, which remained over and above unto them that had eaten. Gather up the fragments. We must diligently preserve God’s blessings and not squander them away, but save them for future needs. But when this is not done, and God’s blessings are so sinfully and shame fully abused. God is driven by such vices to withhold, and where there has been one year of abundant harvests, there will follow two or three years of failure. By commanding his disciples to gather up the fragments that were left over, the Lord does not wish to be understood that we should be covetous, but that you might be able to serve your neighbor in times of need. Luther’s Explanatory Notes on the Gospels, pp. 300-301. Incarnationally unify eye-opening worship plans.